Who Wants To Do Business With People Reek Of Desperation? What might an observer say when asked how committed you are to growing your business? Would the observer be impressed with your level of commitment? What about your dedication to expanding your skill set? And last, what observations would they make about your willingness to invest in your personal and professional development? Over the last few years, I’ve had the honor of interacting with business owners in all stages of business – people just starting out, people who’ve been in business for 30 years and every where in between. What’s been fascinating to witness is the people who are “all in” when it comes to moving their business forward. These people take action, put themselves out there, and surround themselves with experts to learn the important skills they need to stay competitive in their marketplace. On the flip side, it’s been sad to hear of so many people struggling to make their businesses work. And one of the biggest struggles for them is finding prospects willing to invest in their products/services. 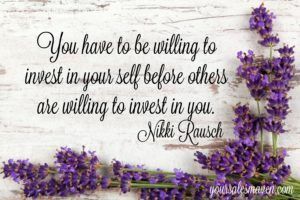 Here’s the tough truth for these people with the “I can’t afford it mindset,” – why would people invest in your product and service when YOU don’t even believe in your business/self enough to invest in what it takes to get to the next level? Bottom line, until you’re willing to invest in yourself, nobody else will be either. Clients aren’t going to show up magically, so you’ll then have the money you need to learn how to get more clients. Where’s the logic in this? It makes no sense. You’ve got to invest FIRST in learning the skills you need to attract clients for them to say yes to working with you. It’s about risk vs. reward. Without risk, you’re unlikely to reap the rewards. Of course, I’m not implying to blindly spend money on every program, service, etc. out there. I am suggesting that you think about how you’re showing up to prospects. When you show up as someone lacking and desperate to close business, prospects sense it. And who wants to do business with people who reek of desperation? This desperation is repelling prospects. People who invest in their business and themselves show up from a place of confidence. It’s this confidence that attracts prospects. When you’re deciding who to spend your money with, don’t you want to do business with confident and successful people? I know I do. It’s one of the reasons I highlight the participants in my programs. I want others to see these are serious business professionals investing in themselves and their businesses. Think about how much time, effort and energy you’re wasting on networking when you’re unable to close a sale. That means you’re spending $5994 per year just on networking. You have to book 6 clients per year at $1000 each to pay for your time and investment to network. Now let’s say you’re not even booking 6 clients a year because you don’t know how to close business and you lack selling skills. Is this a good use of your time? And how much longer are you going to keep throwing money away on things that do not serve you or your business? Now, what if you were booking 6 clients a year at $1000 each and by investing in learning how to be more effective, you double that number to 12 new clients. What would you invest in yourself to make another $6000 a year? Now imagine that after learning the skills you need to close business, you book 30 new clients at $1000 each. Someone mentioned to me recently that a lot of my techniques involve mindset work first. The truth of the matter is when you don’t have your mind right, all the other stuff gets forgotten, overlooked and left behind. The people that do have their mindset right can apply what they’re learning. They’re ready to take action, and they’re willing to take risks to reap the rewards. More often than not when people are struggling to use what I teach it’s because they need to work through the mindset stuff first. The selling skills are simple to apply when you commit. You’ve got to be ready and willing to do the work. Category 1: I can’t afford it. Category 2: I can’t afford not to. I suspect if you’re struggling to find prospects, you’re likely in the “I can’t afford it” category and you’re hurting your business because of it. You’re repelling clients and you’re likely wasting your time and money. Consider setting up a time for us to chat about where you are in your business and what’s needed to take the next step in your business growth. Set up a time to chat here: Chat with Nikki.